At first the WordPress platform was used for creating blogs. With the of the number of available templates and the expansion of functionality it is now used for creating corporate websites and online shops. However, sites powered by WordPress are often loading slowly due to non-optimized images. The OpticPic plugin helps improve image compression in WordPress. Installation of WordPress image compression plug-in does not require special skills. All steps are quite easy to be performed by any user. Once the WordPress plugin installation is complete the image compression will run automatically. The plugin will search for available images and optimize their size without loss of quality. The WordPress image compression plug-in is compatible with the most of popular image formats. Do not forget that image compression is recommended by Google PageSpeed Insights. This will improve the search engine ranking of a website. The Wordpress image compression plugin will boost search promotion without extra efforts. 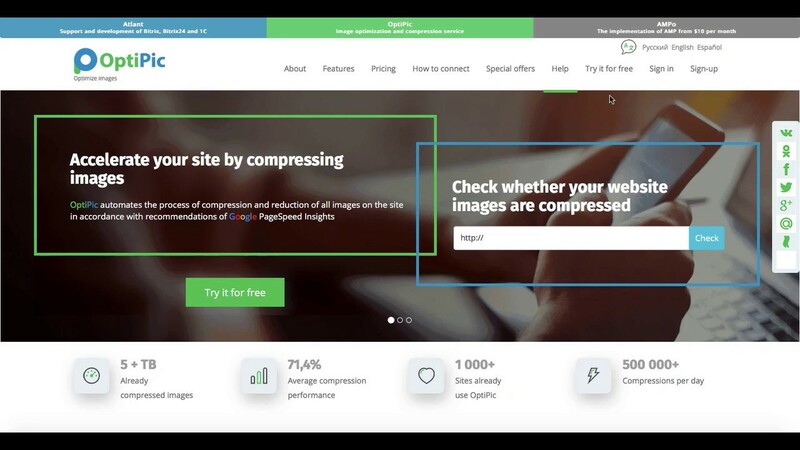 Enjoy automatic image compression in WordPress with OpticPic service and forget about manual compression. An OptiPic plugin for image optimization in WordPress provides an average of 70% of image reduction. This allows loading the site 1.5-2 times faster. The peak values for the optimization of images in Wordpress reach 90%. This provides more space on server disk and cuts expenses with no need for the purchase of disk quota. Image optimization in Wordpress keeps working all the time of the website functioning due to the automatic optimization of newly added images. In fact it takes only 2 minutes to set up OptiPic service with no further involvement in its operations. There are no restrictions in optimizing images for WordPress. OptiPic provides excellent performance with a large number of images and is capable of handling gigabytes of files with minimal load on the service. How can optimizing images for WordPress speed up a site?